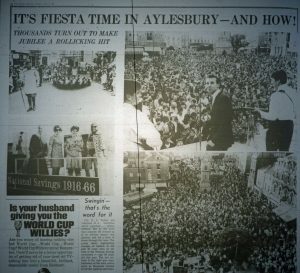 1966 was the Golden Jubilee for the Borough of Aylesbury. As part of the Jubilee celebrations, the first Hobble on the Cobbles took place – an event in the Market Square featuring local bands. With the square barred to traffic it became the centre of a scene which surpasssed all expectations. “Fantastic” was the only word the bewildered organisers could summon up to describe the public’s response. And what other word would fit a situation where the traditional Whitchurch Morris Dancers tripped their ancient measures to the fiddler’s tune at the top of the square while, at the same time, thousands at the bottom end of the square were being bombarded by the drum beat and electric guitars of pop groups. And the musicians on their stage in front of the County Hall beat their way through until midnight. Local groups with modern-moood names gave a solid session. The 5th Dynasty, The Ironsides, Macambos, The Moonbeats, Second City Sounds, The Future Set. 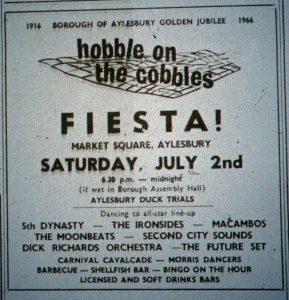 Hi, my Dad was the lead singer from The Macambos who are pictured above. I am trying to get a high res copy of the photograph for my daughter who sings for the local band Nightjar. Can you tell me where I can get that from? 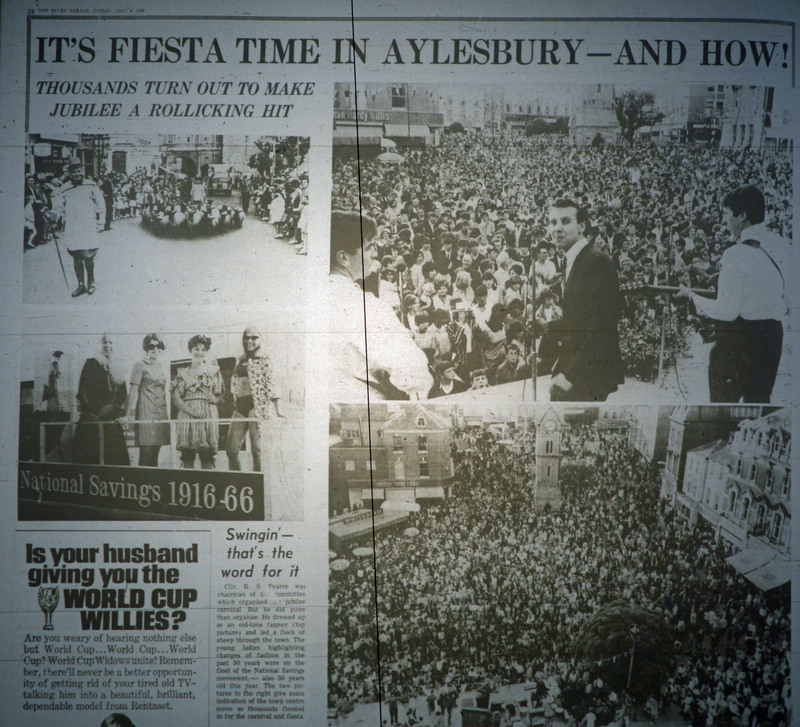 Was it taken by the Bucks Herald?